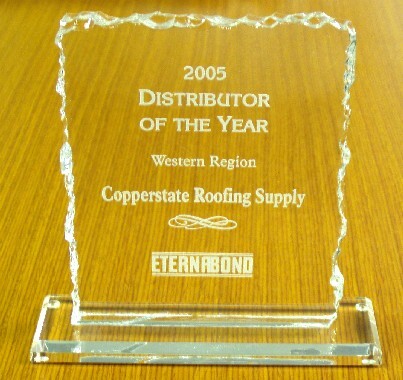 We carry the full line of Eternabond roof leak repair and emergency waterproofing products. Popular Eternabond leak repair products include RoofSeal, WebSeal and AlumiBond / A-Seal and CopperFlash. These are the finest available, easy to use and provide easy yet permanent solutions for roof leak repairs and emergency repairs on all types of roofs, underlayment repairs, RV roof repairs, metal roof seam repairs, gutter seams, and other types of waterproofing repairs. 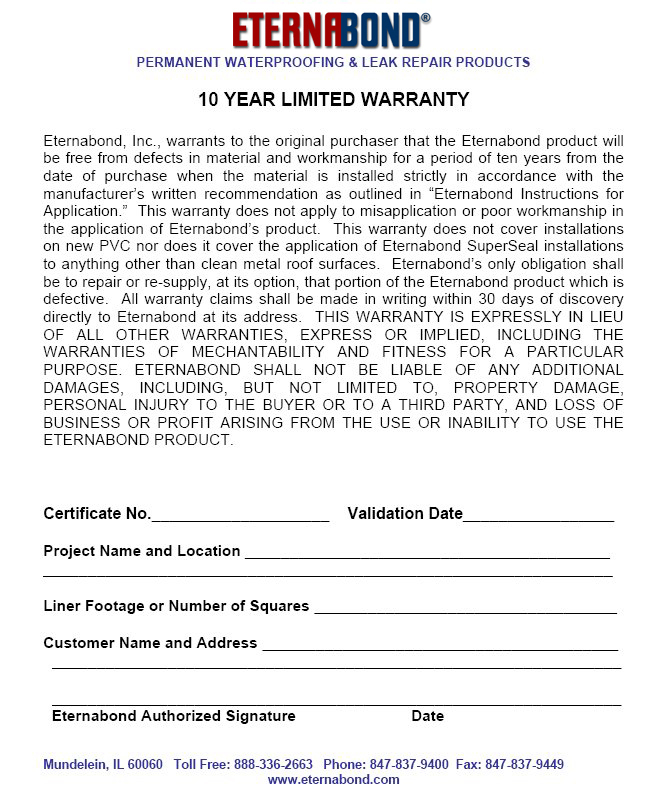 Eternabond roof tape products are used by professional applicators throughout the world and are backed by Eternabond's great 10 Year Warranty. For instant RV roof repair, TPO/PVC flat roof repair, EPDM rubber roof repair or trailer roofs repairs, we recommend Eternabond RoofSeal White roof repair tape. 4" RoofSeal White is our most popular RV roof repair product. Now available in economical 4"x20' rolls in Black or White. Eternabond is easy to use. We have complete Do-It-Yourself instructions for every application. Which Product? See our Eternabond Selection Guide. For granulated roofing materials and asphalt shingle repairs, Eternabond RoofSeal Plus has double the sealant thickness for easy repair of all types granulated roofs including asphalt shingle repairs, granulated cap sheet repairs as well as making seals over rooftop fasteners and gutters. Our singleply Roofing Membranes Repair Page. It includes DIY help for all types of roofing membranes. Alumibond / A-Seal: Aluminum faced for aluminum trailers, corrugated roofs, patio roofs & metal roofs. CopperFlash: Copper faced for all surfaces. Great for resurfacing. RoofSeal Gray: For all types of gray color roofs. RoofSeal Tan: For all types of Tan color roofs. UV Protector/Eternashield: Used together with Webseal for UV protection of Webseal product. 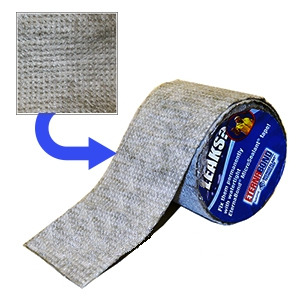 Webseal: Fabric reinforced faced, for seam or joint repairs when a coating will be applied. Commonly used for metal roof seams. Can be used under ANY type of roof coating / roof repair product for long lasting reinforcement. Also as an under-tile waterproofing membrane. Single Ply Roofing Membrane Repairs (EPDM, TPO, Hypalon, PVC, etc. Repairs: See our helpful RV Roof Repair, and our RV Re-Roof & Roof Replacement Tips. Viisit our Roof Repair page to see the latest roof repair techniques (bottom of page). For EPDM and metal use Eternaclean, or clean with a clean rag and a "hot" (fast evaporating) solvent like - lacquer thinner, acetone, automotive brake parts cleaner, or a commercial EPDM cleaner, or a good, non-residue cleaner. For thermoplastic roofs like PVC, TPO, Hypalon, score the surface of with a Scotch-brite like pad (or equal), sand cloth a sanding sponge, etc. Wipe off dust. Clean as needed with a strong bleach/water mixture, then clean water and a rag. Alumibond / A-Seal is used for all type of aluminum trailer roof repair metal roof repairs. It features the thickest aluminum sheet face of products of this type. Its the longest lasting Eternabond product. The aluminum is paintable. RoofSeal Black is great for all types of BUR roofing, asphalt roofing, Black EPDM roofing or underlayment repairs. RoofSeal Gray Eternabond is available in all the popular sizes for gray colored roofs and surfaces. RoofSeal Plus For granulated roofing materials and asphalt shingle repairs, Eternabond has double the sealant thickness for easy repair of all types granulated roofs including asphalt shingle repairs, granulated cap sheet repairs as well as making seals over rooftop fasteners and gutters. RoofSeal White Eternabond's most popular product. Used for all types of white roof repairs. Available in all the popular sizes. Webseal is used to waterproof seams and high stress areas, like metal roof seams. After application, apply a finish coating over fabric layer. It has a fabric reinforcement membrane on the face which readily bonds to the coatings. Utilizing an aggressive sealing adhesive, DoubleStick is sticky on both sides and is perfect for use as a gasket when installing windows, vents, etc. on RVs, mobile homes, steel buildings... Once DoubleStick is applied, you can virtually forget about leaks! In addition, DoubleStick can be folded or rolled into a bead for areas that need a thicker gasket. DoubleStick comes in standard rolls 60 mils thick, 50' long, and 2" wide, and can be special-ordered in 4" and 6" wide rolls. WebSeal is 30 mils thick and is available in rolls 50' long in various widths. Its used were a coating will be applied over the top. 2 layers of coating will be needed. WebSeal has a strong woven backing laminated to Eternabond adhesive sealant tape. Easy to work with and extremely flexible, WebSeal forms around almost anything from a seam or tear to a leaking drain pipe. Once on it stays flexible but never loses its adhesion if properly applied. When used in a place exposed to sunlight, WebSeal is easily protected from UV rays using Eternabond U.V. Protector in white, which brushes on easy and can be tinted to match almost any color. 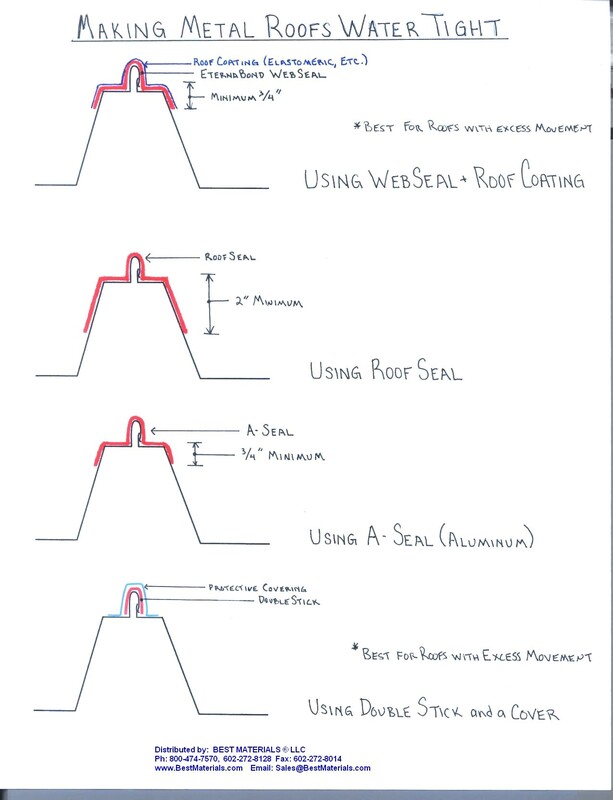 Reliable and easy to use, WebSeal continues to be the product of choice for reinforcement of repair areas, repairing or re-seaming standing seam steel roofs, and more! Use EternaPrime when surfaces to be bonded are dirty (oxidized and cannot be cleaned), or dusty (like on a tar and gravel roof). EternaPrime will prepare the surface by coalescing all loose particles into a solid platform for the Eternabond tape to adhere to. Also use EternaPrime if the installation temperature will be below 40 degrees F (except when using RoofSeal, which can be applied down to zero degrees F). 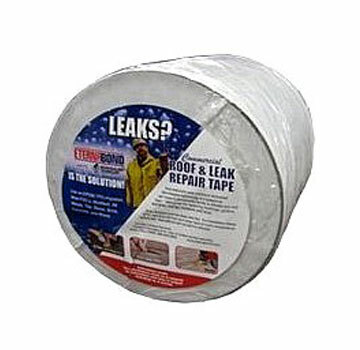 Eternabond Roof Leak Repair Tape is one the most aggressive adhesives available. Originally developed and available for industrial use, Eternabond roof repair tape is manufactured from specially formulated elastomeric resins (MicroSealants) bonded to woven, aluminum, or mixed polymers for maximum conformability. These materials are prefabricated to provide uniform thickness and will expand/contract within normal ambient thermal conditions without ever hardening or losing its adhesive qualities. Eternabond is perfect for surfaces like rubber, fiberglass, metal and even polyethylene and is now available in many convenient sizes. Restaurant Roofs: Around grease vents on restaurant roofs try 12 or 24" wide Eternabond RoofSeal Gray or White. The Eternabond materials are inert to the fatty oils which quickly degrade asphalt based roofing products. You can apply it over cap sheet, foam, and other roofing products to extend the life of restaurant roofs. Just install Eternabond Roofseal in a 5 foot wide perimeter around the vent areas for added protection and to extend the roof life. How UV resistant is Eternabond RoofSeal? No. The base polymer of Eternabond does not contain any unsaturated or double-bonds. Eternabond is already down to a single bond between carbon atoms. Without the double-bonds, there is nothing In Eternabond for the elements to attack, nor can Eternabond attack OTHER elements. It is perfectly safe over EPDM. It does not dry-out over time.